I first took my son on holiday when he was 3 1/2 months old. 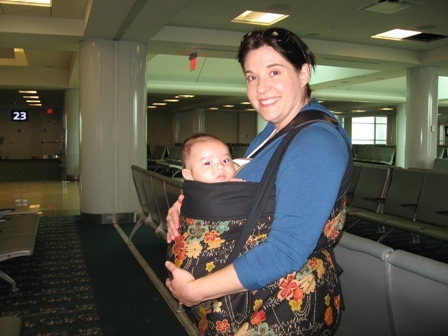 Like many parents, I was nervous taking our son on his first plane trip, particularly because my laid-back husband wasn’t coming with us. My parents have a house in Orlando Florida, and being a less-than-3-hour flight from Toronto, this made the perfect starter trip. I chose to carry B around the airport in a mei tai which proved to be a good choice. It ensured I had both my hands free, and because it has no metal parts, I was able to keep it on when going through the metal detector. On other trips, I have been asked to take him out while going through the metal detector, so be aware this can happen. Since the restrictions frequently change, be sure to visit the TSA's website to find out what the latest requirements are regarding carrying pre-mixed baby formula, breast milk, juice and other liquids. The website also includes information and videos to help you know what to expect when going through security with a child. We used a rear-facing Graco car seat which clicked into the frame of our Bugaboo stroller. I checked in the car seat and stroller so I’d have them to use in Florida. If this seems cumbersome, Orlando has no shortage of services which rent baby gear for the duration of your trip including Traveling Baby) and Kids Gear Here. I have never used a baby gear rental service, so I can’t comment on their quality or service. Many hotels will provide high chairs and cribs – be sure to ask.